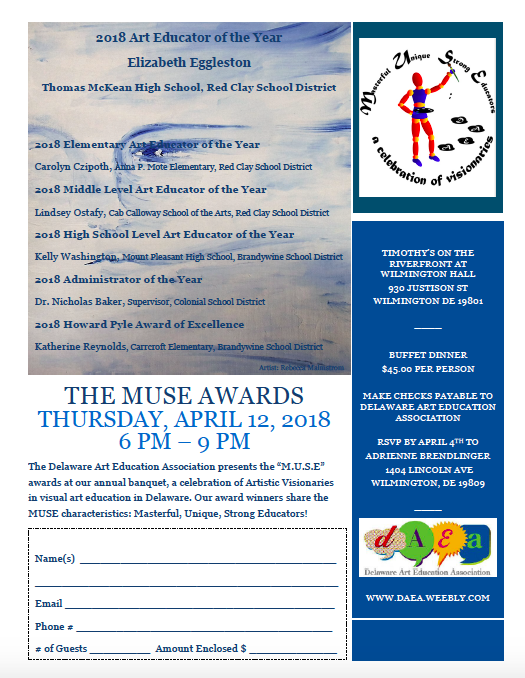 The Delaware Art Education Association presents the “M.U.S.E” awards at our annual banquet, a celebration of Artistic Visionaries in visual art education in Delaware. Our award winners share the MUSE characteristics: Masterful, Unique, Strong Educators! Below, nominate an art educator to be recognized in 2019! Recognize superior Art Education in Delaware! 2. Retired Art Educator Award (rubric): To recognize an individual for continuous outstanding service to art education before and after retirement. This individual must be retired for at least 3 years. Eligibility: Open to any retired Delaware art educator who is a current member of DAEA.